(The Immortals, Peaceful Warrior, The Art of War) and Laura Cayouette (Django Unchained, Kill Bill 2). Q&A following the film with director Esteb and Blake Palmintier, editor. Set in modern Australia, Degree of Separation follows the story of Troy as he navigates his life under the ever-present cloud of domestic violence. An unlikely ally is found in Virianna, an immigrant postal worker, but unbeknownst to Troy, Virianna has her own demons to face. Blake Palmintier bridges the gap between Inspiration and Communication. For the past 20 years Blake has been taking the spark of an idea from his clients and shaping that Inspiration into a vision and eventually into a feature film, a commercial, a documentary, or a Television show. Blake writes, acts, directs, shoots, edits, and produces motion pictures of all kinds. Whether you need one crew member or an entire crew he can make the entire filmmaking process run smoothly for you. He has owned a full service video production company for 20 years. Over that period of time Palmintier's company (Case Maker Productions ) has produced 215 short documentaries advocating for people who have suffered catastrophic life changing energies. These day in the life documentaries are used in pretrial mediation processes and sometimes his demonstrative videos are used in the trial proceedings. In 20 years none of Palmintier's clients have ever lost a case. 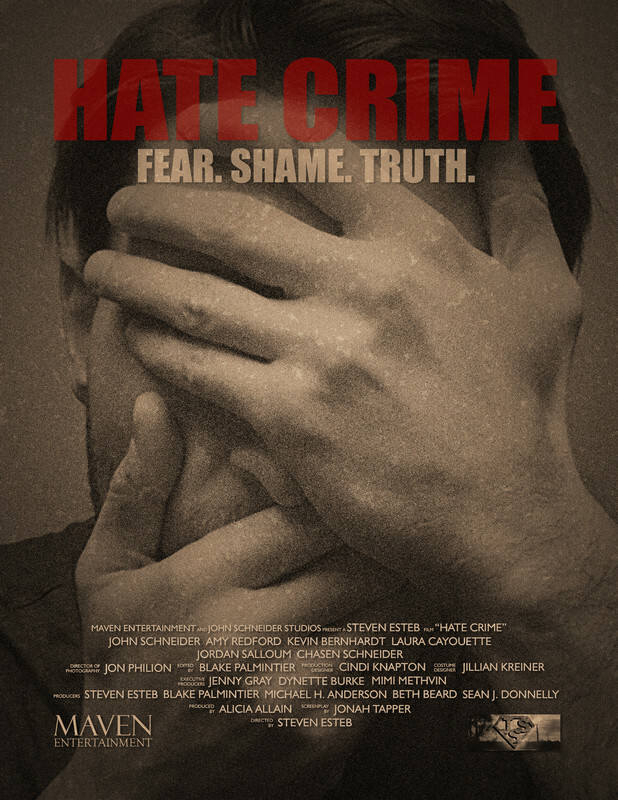 Blake has been a mainstay of the New Orleans film scene working on various projects in front of and behind the camera, collaborating with most of the top filmmakers in the South, including Hate Crime director, Steven Esteb. They have collaborated on many documentaries, commercials and 2 feature films Dirty Politics and and Hate Crime both directed by Esteb. Steven Esteb is a versatile filmmaker that has worked as an actor, a Hollywood screenwriter and directed commercials, music videos, documentaries and features. His films include the just completed family drama Heartland, starring Amy Redford and John Schneider, Dirty Politics, a dark comedy starring Judd Nelson, Beau Bridges and Howard Hesseman, and Baller Blockin', a rap film for Universal starring Lil Wayne, which hit #1 on the Billboard charts in DVD and video sales eventually going quadruple platinum. His first film was called Living With... a documentary about an AIDS hospice in Santa Barbara, his proudest accomplishment. Steve's a WGA screenwriter and has been repped by top agencies like ICM and Paradigm, selling or optioning over a dozen projects to studios and producers, and works as a busy script doctor, coach and screenwriting teacher. He founded the Louisiana Screenwriter’s Bootcamp in 2008, teaching screenwriters from all over the Gulf Coast. Steve studied film production in the graduate program at Boston University and also has a degree in Political Science. He now lives in rural Louisiana, his adopted home, with his wife and two kids. As a small group in Nunavut, Canada prepare for a seminal LGBTQ Pride celebration in the Arctic, the film explores how colonization and religion have shamed and erased traditional Inuit beliefs about sexuality and family structure and how, 60 years later, a new generation of Inuit are actively 'unshaming' their past. Claudia decides to investigate her grandmother's past, who recently passed away. Through a letter, she comes to Marlene, an old German lady who lives in Brazil and keeps her memories inside a pool without water. During the visit, the old lady reveals details of her life that intersect with Claudia's grandmother's past, a German fugitive of the 2nd World War.